Posted on Sun, Jan 15, 2012 : 5:57 a.m.
Jacob Edwards (front) and Zander Milio enjoy time swimming in one of the two Saline Recreation Center's pools. From kid camps to adult workouts, recreation leagues and swimming, the Saline Recreation Center offers people multiple and varied opportunities to get moving. The center celebrated its 20th birthday in 2011, and during the years, it’s changed with the times, offering numerous traditional and trendy classes as well as a wide variety of workout equipment. There’s something to fit any interest, exercise level or age group said Director Carla Scruggs. Franke Schauss plays indoor hockey at the Saline Recreation Center during camp. With 2,200 memberships sold, down a tick from last quarter, people don’t have to live in Saline to become a member. Plus, if someone wants to try the center for a day or a month, there’s a way to do that as well. She said the center has everything from traditional fitness equipment to a wide variety of classes that include the newest trends. Popular classes include turbo kickboxing; TRX, which is suspension training; Zumba, which combines dance and music; pilates; yoga; and Tai Chi. One look through the winter-spring catalog offers a glimpse of the variety of exercise opportunities that are available. The center, at 1866 Woodland Drive, also offers camps for kids run by Sunshine Lambert, recreation supervisor, throughout the year. So, when parents are working, but school’s not in session, there’s something for youth to do. For example, Glacier Games took place from Jan. 2-6, which included a field trip to Splash Universe in Dundee, something that Franka Schauss, 7, of Ypsilanti really enjoyed. 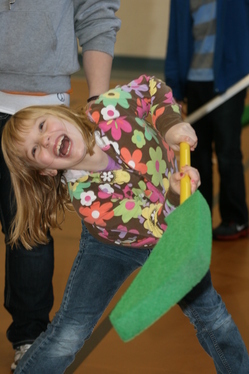 For Annie Jenkins, 8, of Saline, the indoor snow-themed games were a highlight of camp. Lambert said that campers “do a little of everything” from crafts to swim to play all kinds of games. “There are fun mini-camps for in-service and other vacation days during the school year and then there’s the popular summer camp. She said there are many tricks people can employ to stay on track. “Everyone has the same goals, exercise more, eat better, that sort of thing, but you have to figure out how not to fizzle out in two weeks,” she said. A personal trainer will help people set goals, talk about food and help set an agenda for those improvements. For members of the center, a one-hour session is $45. 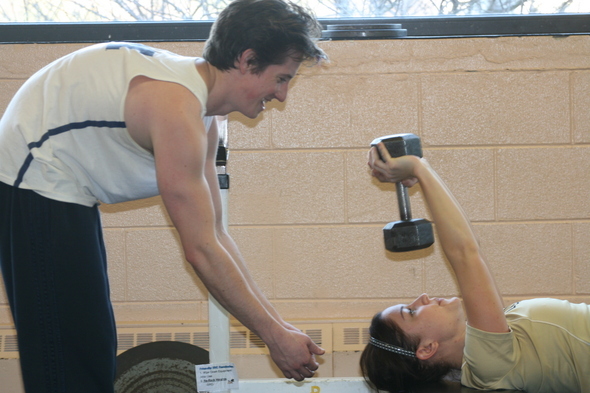 Th rec center has a full-time staff of six and 45 to 50 part-time staff and instructors. A membership entitles people to use of the many exercise opportunities at the center such as weight, strengthening and cardio machines, the two pools and a hot tub. There are several gyms with basketball courts and racquetball courts. “There is something for everyone from infants to seniors,” Scruggs said. 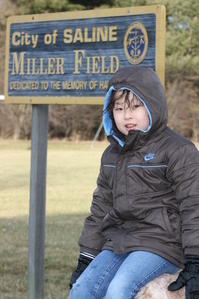 Sola Ishikawa, 8, hangs out on a rock outside the Saline Recreation Center during camp. She said the rec center has many encouraging instructors who work with children and adults, together or separately. “There are lots of families here. Sometimes the parents are working out, sometimes it’s the kids, or both,” Scruggs said. And during the holidays when college students are home, they come to the center and meet up with their friends. That’s just what Chelsie Noble, a student at Western Michigan University, and Fraser Christie, a student at Eastern Michigan University, did during this break. Noble, a runner at Western, was home in Saline for Christmas break and took advantage of the cross-training available at the center. “You can get in 10 different things when you’re here,” she said while working with Christie, a coach for the Saline High School rowing team. “If I didn’t have him here, I wouldn’t work as hard. I’d say, ‘Yeah, that’s enough,’” Noble said of her workouts. Having a workout buddy is something Scruggs says is important to keep people motivated to continue exercising. In fact, she says she’s “a great procrastinator,” so the classes she’s taking go right on the calendar. Plus, knowing that she has the support and encouragement of friends, who act as a support group for each other, is very helpful. For membership prices and center offerings, click here. Fraser Christie spots Chelsie Noble while she works out at the Saline Recreation Center. Sun, Jan 15, 2012 : 4:10 p.m.
Their prices are too high &amp; you can't save your time if you go out of town for a period of time.